The Daimler marque became “Mercedes” in 1902 and the Mercedes-Simplex is largely considered to be the first “modern” car – a departure from the horseless carriages that preceded it. Available as a number of models between 1902 and 1910, the Simplex had engines ranging from 18 horsepower all the way up to 65 – as in the beast you see here. The 65 horsepower (which is available at a rumbling 1200 rpm) comes from a very large 9.4-liter straight-four that. A normal 65HP Simplex would only have 9.2-liters, but this one has probably had many engine rebuilds over the course of its life, thus slightly increasing its displacement. The biggest of all Simplexes, this model was offered between 1903 and 1909. The chassis you see here originally sported a 40/45HP engine when it was sold new in New York. It was acquired by Lindley Bothwell in the 1930s or 40s already sporting this… sporting body. What the original coachwork looked like is a secret lost to time. This is going to be one of the more expensive cars to find a new home at this sale and no pre-sale estimate is available. These big horsepower, early German machines are incredibly hard to come by today. This is a rare chance to acquire one with known history going back 80 years. Click here for more info and here for more from this sale. 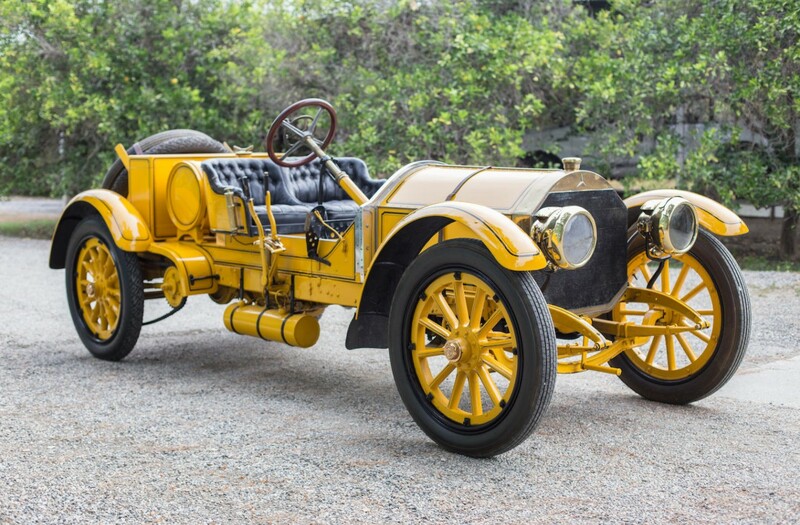 This entry was posted in Uncategorized and tagged 1908, 65hp, auctions, Bonhams, cars, classic cars, mercedes-simplex, raceabout, two-seater by classiccarweekly. Bookmark the permalink.